Artificial Afrika is provocative new multimedia performance work by acclaimed guitarist and composer Vernon Reid. In Mr. Reid’s own words: “Artificial Afrika is based upon Africa's incredibly rich and vastly diverse cultures ranging from Senegal, to Somalia, from Tunisia, to South Africa and all points in between, and the vast, shadowy conceptual landscape that exists in The Heart Of Darkness beating in the Dark Continent. It's the smile of Aunt Jemima and Uncle Ben. It is the Hip Hop artist dripping in gold & diamonds who STILL can't see the conflict. It is the countless ways that the West has appropriated, warped, and extended the notion of an overarching African Culture”. Artificial Afrika is a video art/animation created and scored initially by Vernon Reid, performed with live guitar and sound design improvisation by Mr. Reid and his live performance collaborators: voice and performance artist Akim Funk Buddha and DJ, percussionist Leon Lamont. Renowned guitarist, composer, producer Vernon Reid is probably best known for leading the rock group Living Colour, which has sold over four million records worldwide, and has won numerous awards including two Grammy Awards and two MTV Music Video Awards. Mr. Reid has appeared as a guest guitarist on the recordings of Public Enemy, K-Naan, B.B. King, The Ramones, Mariah Carey, Mick Jagger, Tracy Chapman, Carlos Santana and others. Vernon is also a composer for film, TV and dance, including "Here", a piece for Bill T. Jones/Arnie Zane Dance Company which premiered at the Next Wave Festival at BAM. His film scores include "Paid in Full" directed by Charles Stone III, “5 Fingers” starring Laurence Fishburne, the documentaries “Ghosts of Attica” and “12 Disciples of Nelson Mandela”. 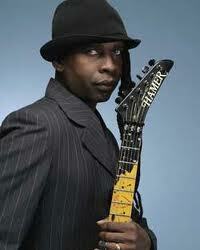 Vernon Reid is ranked #66 of the 100 greatest guitarists of all time by ROLLING STONE Magazine. Akim Funk Buddha – Rapping, Tuvan throat singing, & dance.